The Azure App Service Snapshots feature is now in public preview. Snapshots are automatic periodic backups for Premium SKU web apps. Snapshots are managed internally by Azure App Service and provide reliable, hassle-free backups of your web apps. Snapshots contain both the contents of a web app and the web app configuration. At least one snapshot will be available every 6 hours for the past 30 days. Within the past 7 days, usually one snapshot will be available per hour. 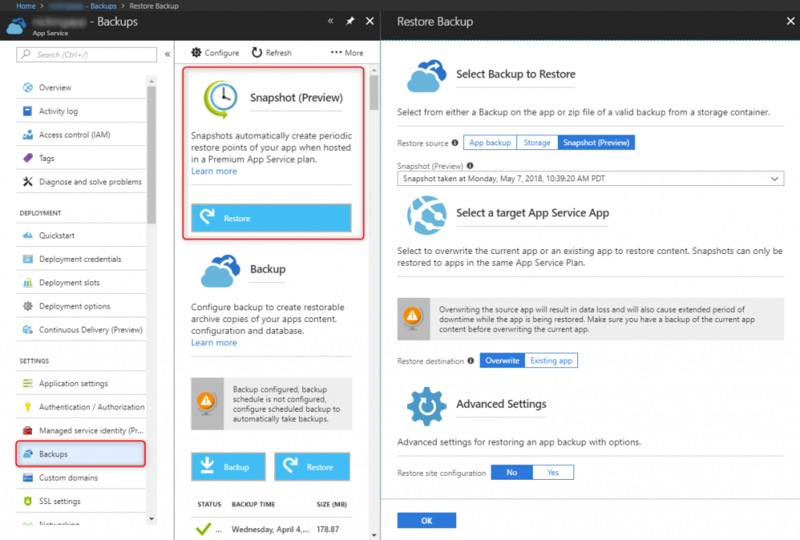 Snapshots can be listed and restored in the Azure portal from the Backups settings of the web app.